Evenflo has long been known for their practical, budget conscious gear. 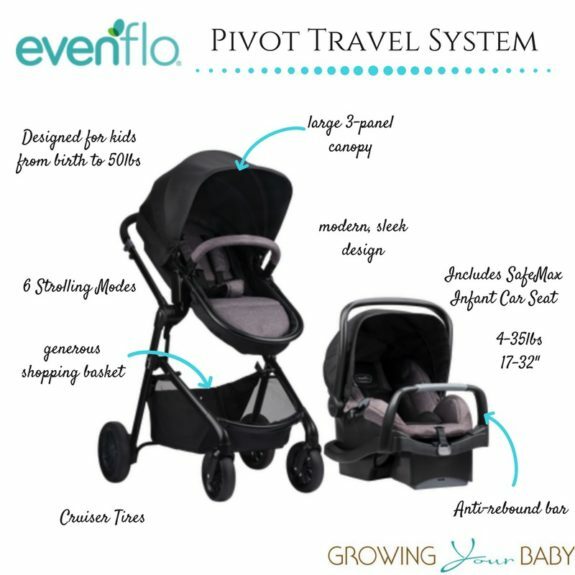 The new Pivot stroller is a departure from the traditional ‘travel system’ they have sold in the past, with a modern modular design. 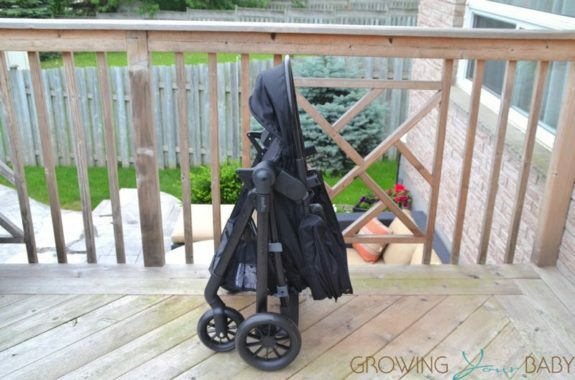 Our stroller is very sleek with it’s black on black design. Out of the box, all parents need to do to get going is pop on the wheels and snap the stroller seat on the frame. From birth, the stroller can be used with the included Evenflo SafeMax Infant Car seat attached to the frame or with the seat in bassinet or carriage mode. The Evenflo SafeMax infant Car Seat is designed for babies 4-35 lbs, 17 – 32 in. The seat comes with upfront harness adjustment, infant head support, and an anti-rebound bar on the base. In bassinet mode, the stroller’s seat can be adjusted to a flat laying position for a sleeping baby. Parents have the option to have the bassinet facing them or facing out. Because the bassinet is not a structured cot it can’t be used for a sleeping baby outside the stroller. 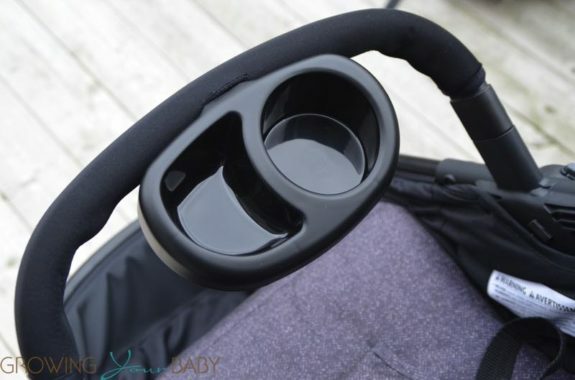 As your child gets older converting the bassinet to seat mode can be done by tightening the belt on the back of the seat and attaching the connector under the footwell. The stroller’s seat is designed for kids up to 50lbs and can be adjusted to 3 height positions. To keep your little one in place, the seat features an adjustable 5-point harness with padded straps and crotch pad. The footwell features a re-inforced panel that can be wiped clean if kids jump in with muddy or wet shoes. 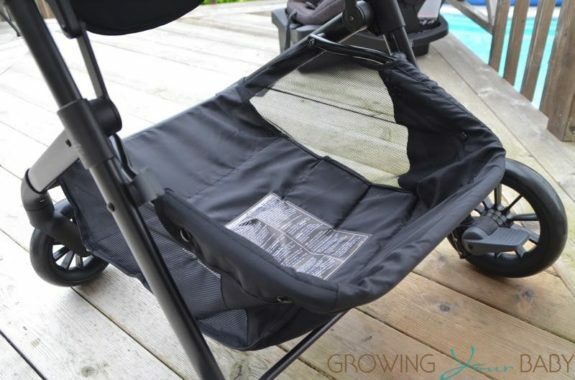 Thre isn’t an adjustable foot rest because of the bassinet design, but the length of the stroller frame is generous enough to keep kids comfortable for a long time. For added convenience, the bumper bar comes with an attachable snack tray. To protect your child from the elements the Pivot comes with a sturdy 3-panel canopy with mesh peek-a-boo window. This is especially generous when in bassinet mode. Underneath the stroller, Evenflo has added a massive shopping basket. 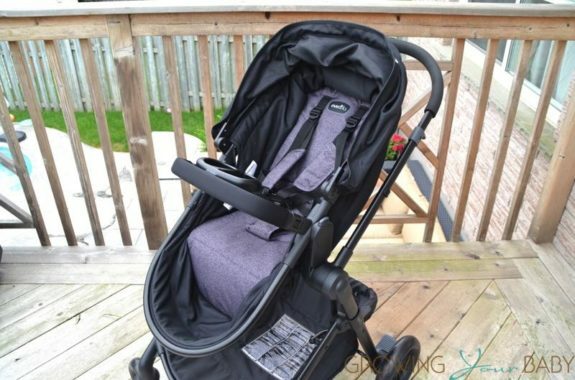 Big enough to hold a large diaper bag and your purchases while out for the day, it also features mesh paneling up to the side to keep your gear in and is supported by a frame so it won’t drag if it’s overloaded. The pivot rides on ‘cruiser tires’. It’s combination of 8.5″ wheels in the back and 6.5″ wheels in the back give it good maneuverability over most urban terrains. It does well over grass, gravel, uneven pavement and some sand. It was likely designed more for park and mall use to don’t expect it to go through the snow or across the beach. It does not have the front wheel lock for bumpier terrain but I can honestly say with all the stroller’s we’ve pushed over the years I have never once used that features so it’s not a loss. The handle bar on the Pivot is fixed at 41″ the standard height for most strollers. Not having an adjustable handle didn’t affect the push between our testers. The stroller’s basket does extend out a bit but it doesn’t affect your stride and I didn’t kick it once while out. To fold the stroller all you need to do is release the levers on either side of the handle and pull the bar towards you. The stroller folds in half, the frame locks and it will stand on it’s own when folded which I love. 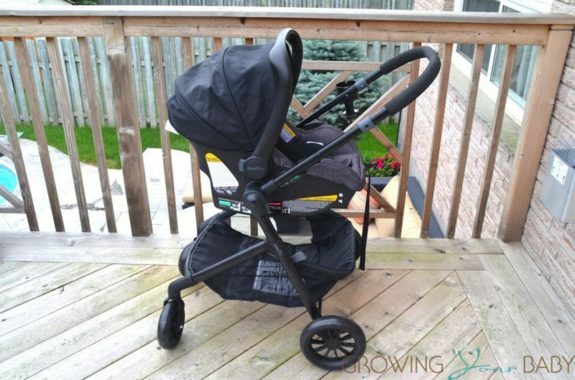 The seat can also stay attached when the stroller is folded. With a retail price of $300 the Evenflo Pivot is a STEAL. 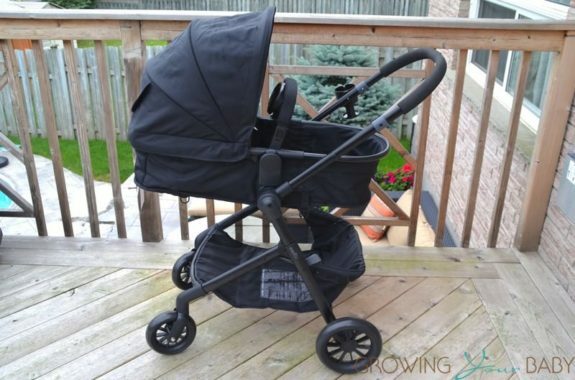 It offers many features of a $1000 stroller at a fraction of the price. Hi I came across your review and I was wondering if you could help me. I recently purchased this stroller and I am having an issue with detaching the snack tray from the bumper bar. Can you tell me how you were able to do it. Thanks. Hello! Pull straight up. It is a bit tight but it will come out. Inside the bumper it’s attached by a nib so you to give a little of muscle to unclip it.